This guide is intended to give you an idea of how much your Liberty Cap Half Cent minted from 1793 to 1797 is worth. The catalog below provides average coin prices and values based upon the condition of the coin. If the coin has wear on it from being used in commerce, it considered "circulated." If it was never used, then it is classified as "uncirculated." The picture links below illustrate examples of each condition. If your half cent is worn and looks similar to the one illustrated in the link below, it is considered a circulated coin. 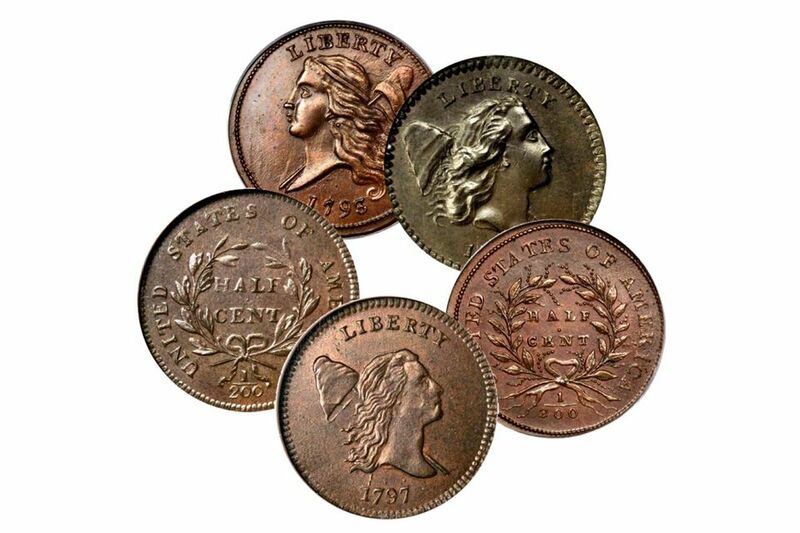 All Liberty Cap half cents were produced at the Philadelphia and do not have mint marks. The following table lists the sell value (what you can expect a dealer to pay to you if you sell the coin). The first column lists the date followed by the sell value for an average circulated Liberty Cap half cent. All circulated values assume that the date is readable and not completely worn off the face of the coin. The column lists the sell value for an average uncirculated coin. These are approximate wholesale values. The actual offer you receive from a particular coin dealer will vary depending on the actual grade of the coin and a number of other factors that determine its worth.